Regular readers will know that I attended the Baby Show February and October last year. February I was trying to conceive so I felt a bit of a fraud there, but October I strutted my stuff, bump on display and felt fully at home. The thing that impressed me most about October was the amount of products that launched there, that made me feel like I was in a privileged place, seeing things not yet in the shops, like some sort of secret baby society. Well The Baby Show has done it's thang again and here is their press release detailing more exciting new products. It really is one of the best reasons to attend. That and the fact you get to see all the baby brands worth seeing all under one roof, perfect if like my cousin, you are going there to make your all important buggy decision. The Baby Show with MadeForMums is returning for a 14th year! The UK’s biggest shopping destination for new and expectant parents is set to return to ExCeL London from 19th to 21st February, bringing with it lots of new, exciting and innovative product launches from the biggest brands in the parenting industry. So, what should you be getting your hands on in 2016? Based on the 75 year Finnish tradition, the British Baby Box is packed with luxurious, British sourced baby essentials for when you bring baby home – including a mattress and sheet so it can be doubled up as a baby’s first crib! In addition they’ve teamed up with Molly & Monty so you can choose a selection of their organic baby clothing to gift to a friend or loved one. Credited with helping Finland achieve the lowest infant mortality rates in the world, by providing parents with an essential starter kit, British parents can now, for the first time, enjoy this lovely tradition themselves. Prices from £50 to £150. Visit stand N46. Onni Smart Care - not just a baby monitor, but a whole baby monitoring system, has been designed by busy parents who know first-hand what a juggling act it can be to stay on top of what’s going on with the next generation. The parents behind Onni think there’s more to smart baby monitoring than just seeing and hearing the child, which is why they’ve invented a new, versatile baby monitoring system with HD quality video streaming, alerts and online tools that help parents monitor, measure and stay connected. With Onni, parents can keep track of when the baby last fed, slept or had a nappy change, enabling them to be better prepared to meet the baby's unique needs as well as pinpoint changes in patterns. Parents can also keep track of the child’s growth and developmental milestones and see how the growth correlates with WHO growth charts. What’s more, virtual visiting hours can be granted to those eager grandparents who just can’t visit enough. The first Onni Smart Care baby monitor, Twinkle, is launching at The Baby Show. Price: £99. Visit stand E36. More than just a nightlight, Cozyglo lamps are cute bedside friends that aim to give comfort and security to children, helping them drift off to sleep. They emit a warm, cosy glow and features include a dimmer, clock, stopwatch, thermometer and sleep trainer (countdown light timer and light alarm). These lights have been designed with both parents and children in mind, and are useful from birth - during the months when the little one might be in your room, whilst also being an attractive feature of any child's bedroom, used for story time and sleep training. Price: £49.99 (20% off at the Baby Show). Visit stand E30. The MyCarrier™ from Stokke® is a comfortable baby carrier that is suitable for use from 4 weeks old. Exciting new features are being added such as a wide seating position when facing inwards and two optional seating positions for the back carrier so it’s a perfect fit for both parents and baby. It’s been designed with consumer feedback in mind so it’s now simple to use and adjust, and folds to a compact size for easy storage. The broad hip position ensures correct ergonomics for your developing baby. Soft but durable materials withstand daily usage whilst cushioning your little one for a comfortable ride. Consumers will be able to place their order at the Show ahead of the official product launch in mid-March. Available in both Organic Cotton or Breathable Mesh materials. Priced at £129 for the MyCarrier™ Front and Back Carrier and £99 for the MyCarrier™ Front Carrier only, the MyCarrier™ Back Carrier can be purchased at £49 as an accessory to the Front Carrier later on. Visit stand J20. Every child develops at their own pace. The Philips Avent 4-in-1 healthy baby food maker produces tailored meals that give babies the best start in life so they enjoy a healthy future. The 4-in-1 functionality of ‘steam-blend-defrost-reheat’ means it’s never been easier to be a great chef and feed your child nutritiously. Preparing food can be quick and simple, so you can focus on the joy of every moment with your baby. You can effortlessly create tasty and nutritious meals with the help of the recipe book included or download the easy weaning app. Price: £130.00. Visit stand H20. Cuddle Mates were created by parents for little kids aged 12-36 months to help them sleep better. What makes Cuddle Mate pillows so special is their shape. Little kids simply love wrapping both their arms & legs around their Cuddle Mate for comfort and reassurance all night long. Cuddle Mates encourage side sleeping which is safe and healthy according to the American Chiropractic Association. Babies love Cuddle Mates too! They are perfect used as a wedge, for ‘tummy time’ and that extra bit of support that babies need as they learn to sit up. Cuddle Mates were inspired by the Far East where generation after generation of parents use similar shaped pillows to help their kids sleep better. Handmade, they are made from 100% super soft cotton fabric and are completely machine washable. Price: £19.99. Visit stand B14. Rainbow in my Jar are a British brand making eclectic styles to last through maternity and beyond, using skin-friendly natural fibre blends in vibrant colours. Excitingly, they will be launching their brand at the February Baby Show! Their focus is on unique colour combinations and bold prints/unique embroidery on material that is soft on the sensitive skin of pregnant and nursing mothers. They have ditched the traditional maternity styles and designed garments that look stunning even beyond maternity. What’s more, most of their garments have pockets that expecting mums love! Dress prices range from £50-£110 and tops from £30-£60. They will be offering a special 35% discount especially for visitors to The Baby Show. Visit stand C36. The Baby Show sees three hugely successful parenting brands join forces to launch their first ever joint babywear range - Zippy Baby Ltd and In The Night Garden and JCB. The clothing and accessory items capture the essence of the popular TV shows whilst featuring the design innovations that Zippy Baby is famous for. The BBC’s biggest brand, In The Night Garden, launches bandana bibs that look like a beautiful clothing accessory but keep babies drier for longer; muslin cloths that give an everyday essential a ‘pop’ of colour and innovative zipped all in ones that reduce the time and stress of every change. Each item comes in a variety of stunning prints that reflect the enchantment of the programme and its characters. The perennially popular characters of the ‘My 1st JCB’ team are at the heart of the bright and fun designs from JCB. 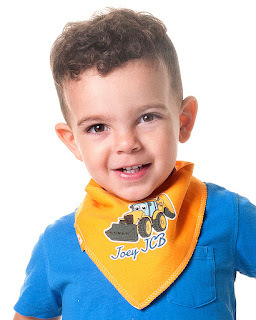 Alongside bandana bibs, muslin cloths and zipped all in ones, JCB’s items also includes long-sleeved tops featuring real construction hero Joey JCB. Perfect for any budding builder. Price: from £9 to £14. Visit stand C11. NAÏF gets set for seriously natural summer fun with new SPF50 Protecting Sunscreen! NAÏF has babies and kids covered with a new SPF50 Protecting Sunscreen that has been expertly formulated for little ones sensitive skin. The preservative-free, mineral-based and ultra-hydrating formula contains natural UV filters that physically deflect the sun’s rays for optimal broad spectrum protection together with the best ingredients nature has to offer and nothing else. Price: £15 for 100ml. Visit stand J48. MORI is the ultimate in refined, well-designed and functional baby clothing and gifts, and they will be launching their brand new product range at The Baby Show. This gender-neutral range is crafted from innovative and ultra-soft bamboo cotton fabrics, and each garment is as intelligently designed as it is charming. Other recent additions to the family include beautiful cotton throws and 100% pure Mongolian cashmere blankets. MORI also offer a unique parcel service – simply subscribe (or gift a subscription!) and receive beautiful baby essentials through the letterbox monthly - expertly curated to keep pace with baby’s growth and the changing seasons. Choose from three parcel sizes, add any preferences and then sit back and relax in the knowledge that baby’s wardrobe essentials are covered. Prices start at £20 for a single parcel and subscriptions from £12 a month. Available in sizes 0-3yrs. Visit stand E14. Fill n Squeeze will be launching their revolutionary cleaning product, ‘Probiotic Stain Remover’ that is set to change how we remove common stains from around the home. Introducing the Probiotic Stain Remover, an innovative cleaning spray designed to safely and effectively remove blemishes using ‘friendly’ bacteria. Developed using selective strains of naturally occurring microbes, this lime and grapefruit scented spray effectively removes stains caused by food and drink, as well as bodily accidents. The product, which has been manufactured in the UK and is 100% safe to use with new born babies, works effectively on carpets, mattresses, bedding and other soft and hard surfaces – this natural cleaning product is sure to become a must have for every family. Price: £4.99. Visit stand N47.